The Archer aids the party with an assortment of skills and summons the forces of nature to protect them. They are a tactical part of any group, providing dangerous long-ranged attacks and strategic support. Once their sights are set on an enemy, resistance is futile. Archers start out with the highest damage output of any class in the game. The Archer can equip a bow or crossbow. They can only wear armor specific to their class or level. Main attributes are Strength (more damage) and Spirit. This will increase your chance for critical hits and add more Spirit Points. For your skill empowers (under skills button "K" key), focus on increasing damage output and increasing the cool down of important skills such as Power Shot and Aimed Shot. You can empower skills beginning at level 3. Don't worry about using up all your skill empower points and not being able to change them later; you can buy a skill empower reset scroll in the Fiesta store and try a different combination. 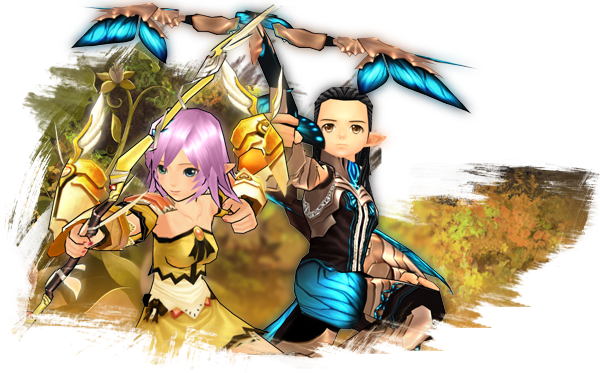 At level 20 you can become a "Hawk Archer" through your class trainer quest and grow in your skills and power and at level 60 you can become a powerful "Scout".